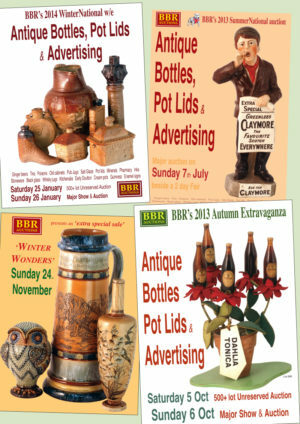 4 quarterly Antique Bottle auction catalogues each year, plus 2 Antique Advertising & Breweriana, plus MORE! EVERY Sunday lot illustrated in colour, along with a description etc. An invaluable way to stay one step ahead with price fluctuations & trends. 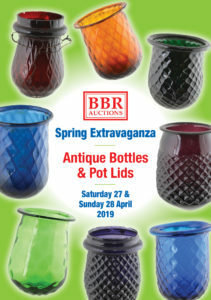 Most every auction features BBR’s entire range of well known specialist collecting areas, & 3 catalogues also include the Saturday General Auction listings – up to 500+ lots. 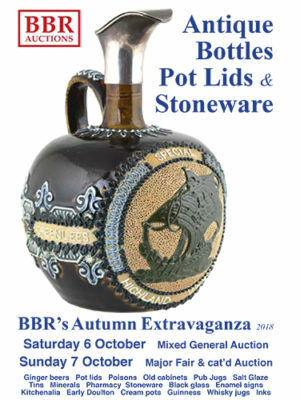 BBR Auctions prides themselves MOST items offered WITHOUT reserve, there to sell. Absentee postal bids + live telephone bids taken, along with an experienced in house, low cost, after sales p & p service. 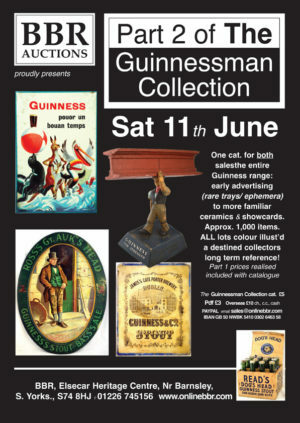 View all previous sale catalogues in our archive.